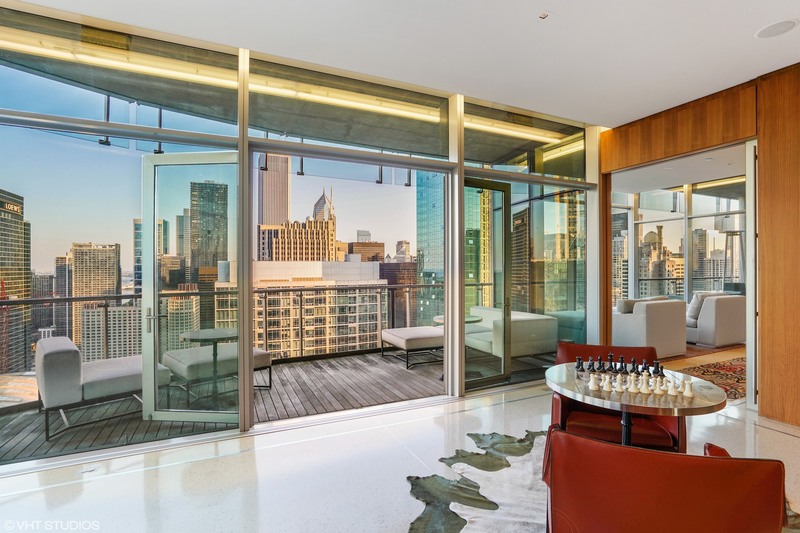 In Chicago’s popular Streeterville neighborhood, 600 North Fairbanks is perfectly situated for you to experience your version of city life with museums, music, Millennium Park, shopping, entertainment, fine dining and recreation just minutes away. 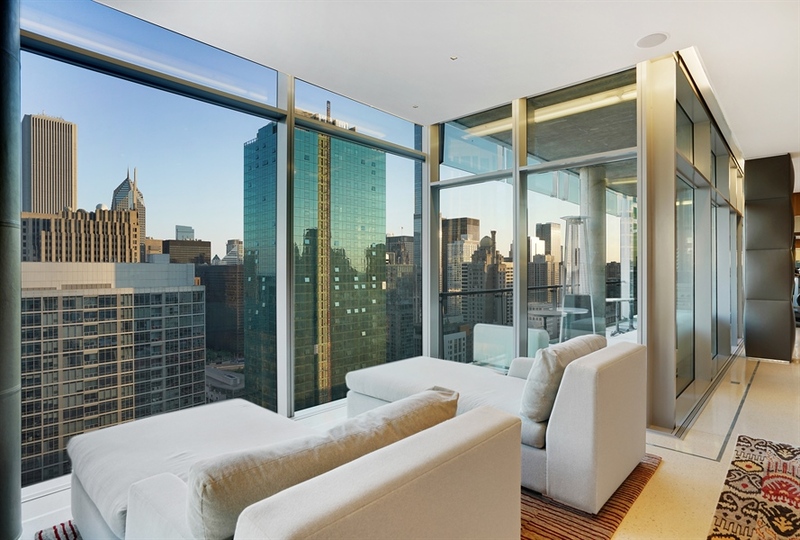 Buying the space raw from the developer, the seller combined two units and invested over $4 million integrating the space into a remarkable contemporary home with extraordinary views that capture all four exposures. The home encompasses half a floor with floor to ceiling windows and a view spanning more than 300 degrees. The architect was Brent Norsman, the designer, David Lentz and the contractor Sylvester Construction. 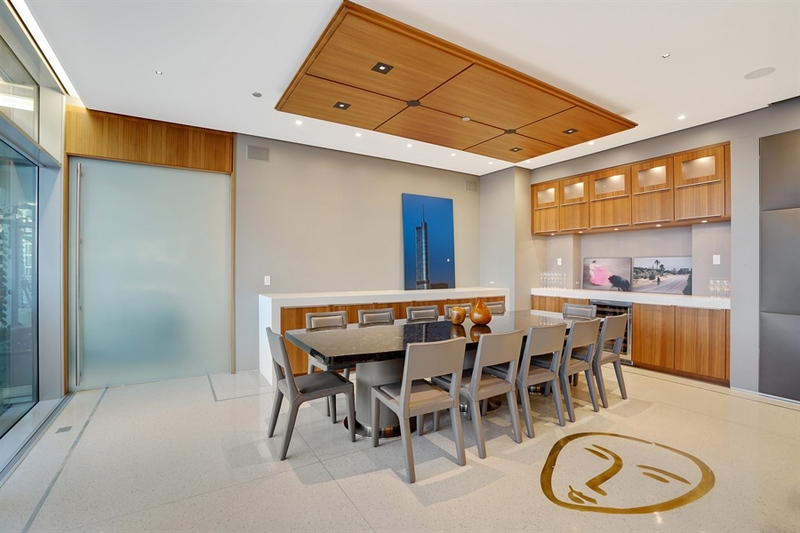 Custom mixed terrazzo floors are found throughout all 4500 square feet. These custom floors are inlaid in several areas with silhouettes by Matisse, Picasso and even the cover art from a Carnegie Hall concert with John Coltrane and Thelonious Monk. Led lighting is inlaid in the hallway leading to private quarters. 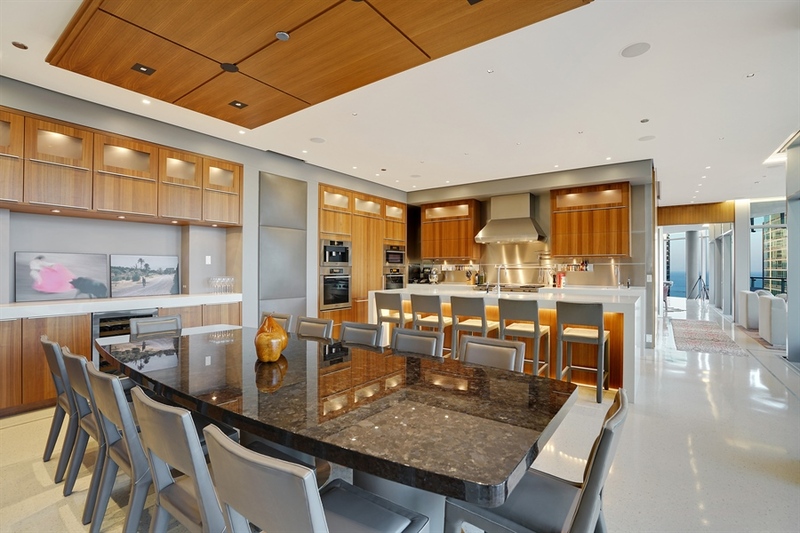 Book matched black walnut mill work is prominently featured, both warming and balancing the hard surfaces of the glass curtain and terrazzo flooring. It is found throughout the library, wet bar, accented in bedrooms and even found as a lighting cloud on the ceiling in the dining room. 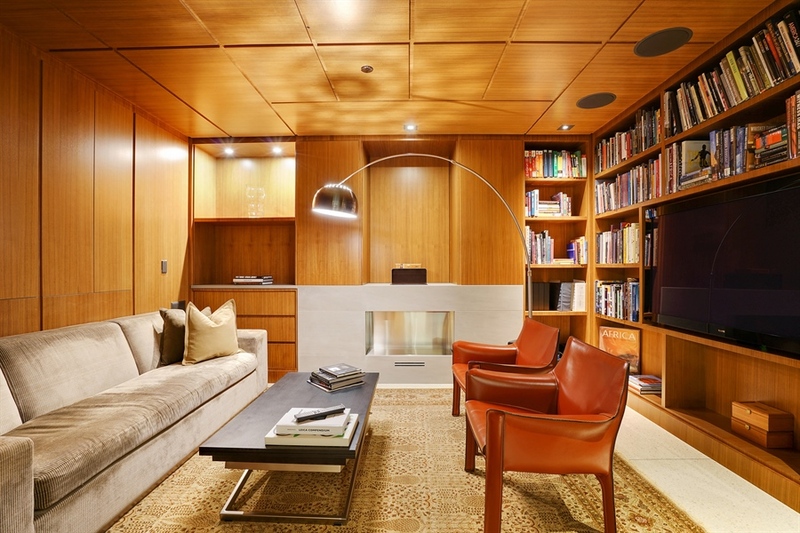 Fire up a cigar in the library where you can blast music only you will hear. The room is equipped with a specialized exhaust system and complete soundproofing. This is the only interior room in the home allowing for total darkness while watching movies. The entertainment system consists of a movie/music player with 6 cable boxes wired to any or all of the 15 televisions screens in the apartment. Four of those screens are found in the office where you can monitor multiple channels simultaneously. The HVAC system consists of 7 separate zones with temperature sensors that blend seamlessly into the walls. The air floor system raises the floor 5 inches to provide underfloor distribution of heat and cooling. There are no thermostats in the unit – everything is controlled by a smart system including music, blinds, drapery, temperature and lighting . There are also no thresholds in the unit – it is one continuous flow of beautiful, creamy colored terrazzo. Electrical outlets have no cover plate, they are laser cut openings. 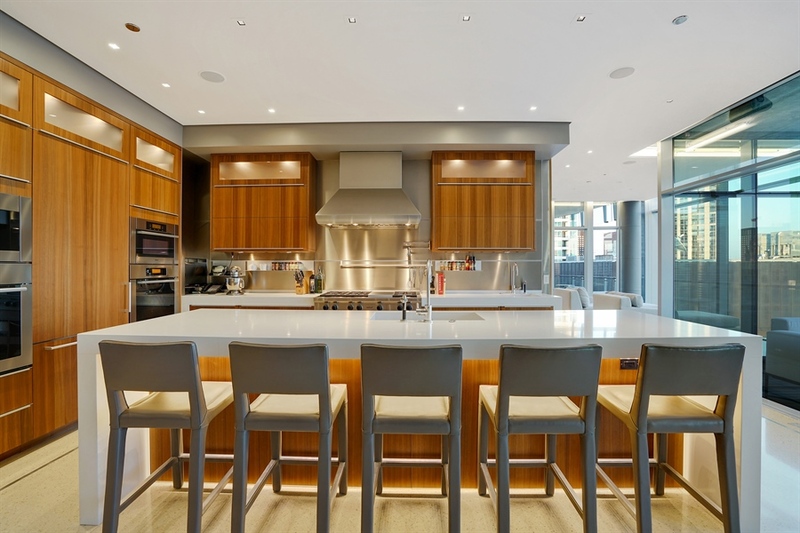 The kitchen is designed for large scale gathering with custom Poggenpohl cabinetry, seating at the island for 5 and a large marble dining table ready to accommodate 12 for sit down dinners- complimented by one of 3 stunning terraces, all with ipe decking. 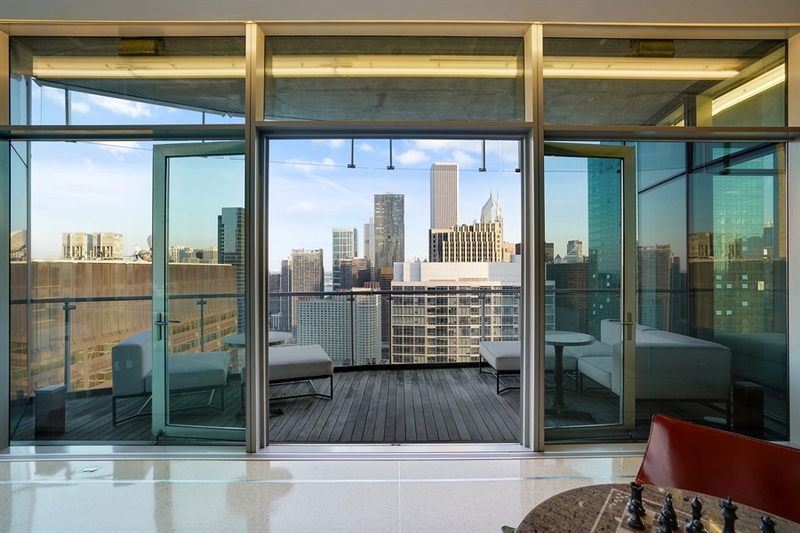 Capturing the brilliance of the city skyline, the kitchen deck provides a covered area for year-round grilling. A third bedroom could easily replace the gym and spa area, which is decked out with state of the art equipment, a sauna, steam and Jacuzzi soaking tub that can be filled from a fixture in the ceiling. The views provide a perfect back drop for getting lost in your workout. 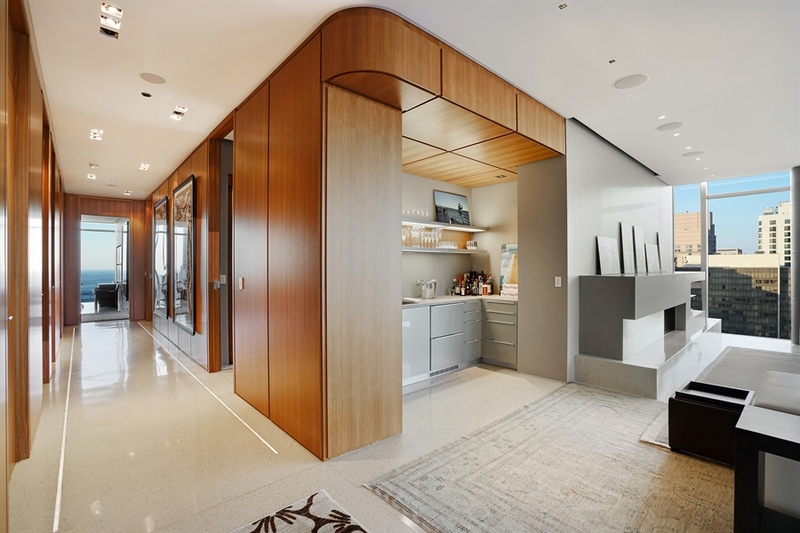 This stunning unit is listed for $4.5 million with Baird & Warner and is showcased by Luxury Portfolio.